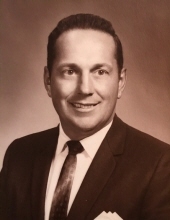 David Paul Aubin, 90, of Harrisville, passed away Wednesday, September 5, 2018 in Landmark Medical Center, Woonsocket. He was the husband of Cynthia (Taft) Aubin for 67 years. Born in Pascoag, he was the son of the late Adeus J. & Thelma (Myers) Aubin. David worked as a salesman for the former Edgcomb Steel of Slatersville. He served his country in the US Navy. He was a Boy Scout Leader for many years and loved the ocean, whether it was boating, fishing, clamming or quahogging. He always had a green thumb and enjoyed his many hours in his garden. He liked to cook and his famous Clam Chowder was always a staple at picnics. He will be deeply missed by all. Besides his wife, he is survived by a sister: Yvonne Williams of Pembroke, NH, two sons: Carleton Aubin of Pascoag and Jeffrey L. Aubin of Harrisville; a daughter: Dr. Marcia Aubin of Narragansett; Four Grandchildren: Elaina Brown, Carla Aubin, Robert Aubin, and Angela Aubin, all of Harrisville and four great grandchildren. He was the brother of the late Arthur Aubin, Jeanne Brissette and Pauline Wennmacher. Funeral services are private at the request of the family and are under the direction of the Boucher Funeral Home. To send flowers or a remembrance gift to the family of David P. Aubin, please visit our Tribute Store. "Email Address" would like to share the life celebration of David P. Aubin. Click on the "link" to go to share a favorite memory or leave a condolence message for the family.